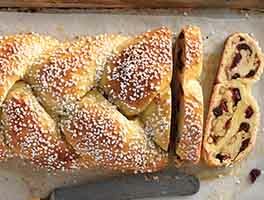 This traditional Greek Easter bread is terrific for Easter brunch, slathered with butter; and any leftovers make the world's most outrageous French toast! A nice thing about this recipe is that the work is broken up into two sections. The first day you make and knead the dough in the evening, then pop it into the fridge for a long, slow rise. On the morning of the second day you shape the dough, then let it rise again and bake it. The traditional flavoring for the bread is a spice called mahlep. In a pinch you can substitute vanilla, but the mahlep is worth finding. It adds a distinctive cherry/almond, sweet-nutty flavor that's unlike anything you've tried before. 60 mins. to 1 hrs 10 mins. 12 hrs to 15 hrs 20 mins. While the starter rests, ready the dough. Melt the butter over low heat and set it aside to cool. In a small bowl, combine 1 cup of the flour with the sugar, dry milk, salt, and mahlep. If you're substituting vanilla extract for mahlep, stir it in. Add the flour/sugar mixture and stir until everything is incorporated. Add the remaining 1 1/2 to 2 1/2 cups flour 1 cup at a time, as needed to make dough that's stiff enough to form a ball but is also soft and slightly sticky. Liberally butter a 9" round cake pan, or line a baking sheet with parchment. Divide the dough into three pieces, and set them aside, covered with lightly greased plastic wrap. If you're using the dyed eggs, rub each one with a paper towel dipped in vegetable oil and set them aside. Make three 16" strands with the dough; pinch the ends together at one end. Braid for 4" to 5"; tuck an egg into the braid. Continue to braid, placing another egg into the braid at 2" intervals. 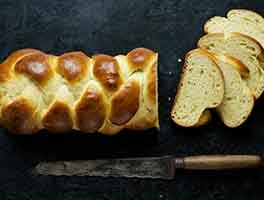 You can make a longer, thinner braid with five eggs, the braid formed into a wreath shape and placed in the round pan; or a shorter, straight, thicker braid, using three eggs, as shown above. Cover the pan with lightly greased plastic wrap, and let the loaf rise at room temperature for 2 to 2 1/2 hours; if you're using the round pan, the top of the loaf should be just barely level with the top rim of the pan. During the last 45 minutes of the rise, preheat your oven to 350°F. To bake the bread: Lightly beat the remaining egg. Brush it over the loaf. (Alternatively, omit the egg wash if you'd prefer to brush the loaf with honey when it comes out of the oven.) If you're baking a round loaf, press the last hard-boiled egg firmly into the center of the risen loaf. Yield: 1 loaf, 16 slices. If you're planning on red eggs for decoration, bake the bread with undyed eggs first, then swap for colored ones once the bread has cooled. 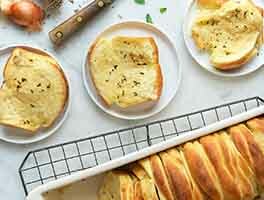 This is a wonderful recipe and by far one of the best I've ever tried. I make this bread twice a year. Once for New Years and once for Easter. At Easter, I braid it with the traditional red eggs. At New Years, I place it in a round 9 inch pan, with a coin (wrapped in aluminum foil). The coin is placed in the bread and whoever gets it in their slice has good luck all year. 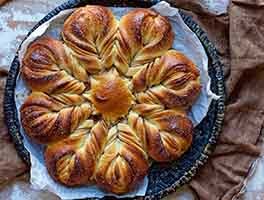 At Easter the bread is referred to as Tsoureki and at New Year's it is called Vasilopita, in honor of St. Basil for his care of the poor. It's the same recipe. The only thing I would do differently is, I would start early in the morning and let it rise, versus placing it in the fridge over night. Wow, this is an amazing recipe. My tsoureki was perfect! Everything went well, but my bread reached 190 degrees faster than expected. I baked it the first 20 minutes without foil, as instructed, and then with foil I only had it in the oven another 10 or 15 minutes. The texture was perfect, and the flavor was authentic! (I bought mahleb at the Greek grocery store (Papa Cristo's) in Los Angeles. Mahleb makes all the difference.) Next time, I will only use 1 red egg at the top of the braid. The eggs stained the dough, and I had to waste a lot of bread when I cut around the eggs. The final product was picture perfect, if I do say so myself. The family loved it and swooped in to take photos before it was cut apart. It will be the go-to Easter bread from now on, rather than hot cross buns. I had issues with the timing, with making it Saturday evening and then braiding, rising, and baking on Sunday before the family Easter Egg hunt, which I missed this year. All sins were forgiven when everyone saw the reason for my absence. Yes, it was wonderful and I will make it again. I did have some issues with order in which the recipe was written, but I will take care of that next time by rewriting for the way I write, read and use recipes. All I can say is "Woo Hoo!" I make this bread a few times a year. Mehlep is the best spice to use and not too much as it is a strong spice. After I form the breads, I brush the tops with a beaten egg diluted with one tablespoon milk and sprinkle with sesame seeds. I tried this but go back to my family recipe because it has stood for probably a hundred years of Easters in our family. Many Greek families do use the mahlap but we use anis. We use the anis in the bread and the seed sprinkled over as well. We use scalded milk, butter and lots of eggs. We put the raw dyed eggs into the bread then let the dough rise around the eggs so they don't pop out when baked. This bread also makes the best bread pudding you ever had so make a lot then freeze the extra for the day you want to serve a bread pudding. The interesting part of the bread is the significance of it. The anis or mahlap is to represent the oil which was put on Christ at his burial, the egg to signify new life in his rising, the red dyed egg to signify the blood he shed in his sacrifice for our sins. It is one of the best. I made a few different version of this and none tasted this good. I had a problem with baking temperature and the time. My oven is Wolf and the heat is very accurate. I gave 20 min and then gave another 30 min to bake. Unfortunately last 30 min was too much and burned the beautiful bread. I got busy with something else and didn't checked until I started to smell. It is Easter and we just trimmed the crust and ate it anyway. I will try next time with 325F. I might add a bit more sugar as I like them sweet. 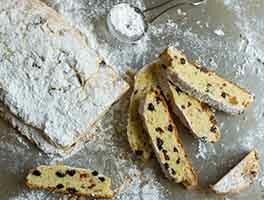 I am planning to try the recipe again with mastic gum and/or raisin added version. I took this bread to an Easter Brunch and it disappeared! Definitely glaze it with honey when it comes out of the oven. It was delicious. I did not bake it with the eggs, but it didn't matter as it was still beautiful with just the braids. Made this for Easter, minus the colored eggs. I didn't have the baker's dry milk and used nonfat dry milk, and when I checked for doneness my thermometer registered a bit higher than 190. That being said, everyone raved about it and it was quite soft. I want to try again with the baker's dry milk and cutting the time down, mine was probably done closer to 42 minutes vs the 45 minutes I baked it at. 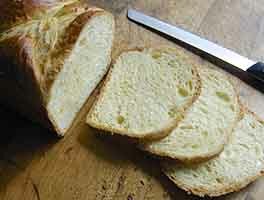 I also added about 5 drops of fiori di sicilia, that was a good idea, the bread smelled slightly of citrus. FANTASTIC! I did have Mahlep but in seed form, so I crushed them slightly and steeped them in hot water and substituted the "tea" for some of the water called for in the recipe. I should have made two smaller loaves but wound up with a very large round braid. It is slightly sweet, soft and oh so tasty. I hope I will have a few leftover bits for French toast.